Transforming vacant space into a pedestrian-friendly and sustainable civic campus. The Franklin County Government Center is a new civic campus located in Downtown Columbus. The Government Center Pavilion and LEED Gold-certified Franklin County Courthouse face Courthouse Square, a major new civic space and the southern gateway to downtown. 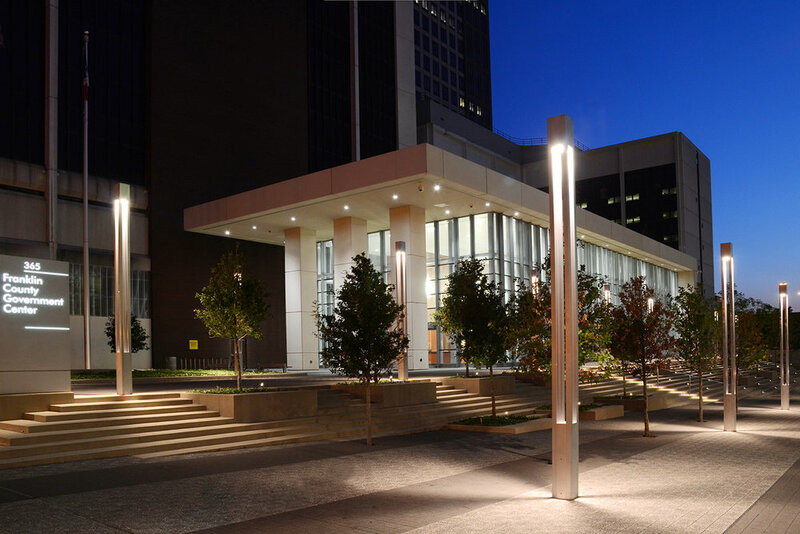 MKSK was the urban design consultant for the master plan and collaborated with the architectural teams to develop an urban design framework, Master Site Plan, and site design for both the Government Center Pavilion and Courthouse. High quality urban spaces include an entrance forecourt, pocket parks, outdoor plaza/seating terraces, and new streetscapes. Improved signage and wayfinding provide an enhanced and more intuitive urban campus for the public. A highly visible rain garden at the corner of Mound and Front Streets incorporates the latest in rain water harvesting and sustainable stormwater management while preserving valuable green space for public use. The project also accommodates alternative transportation modes, including well-distributed bike parking throughout the site and transit stops integrated into the landscape.